How Do Pliers Work As a Lever? 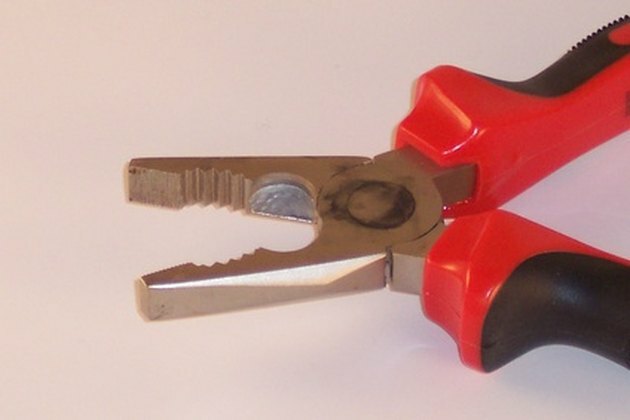 A pair of pliers, as the name implies, consists of two levers working together to give the user a tighter grip than would be available with bare hands. Understanding how those levers function and interact can make for a child's science project, or simply help a workman understand the tools of his trade. Pliers are classified as a complex tool. The lever is one of the six simple machines from which all other machines are constructed. The other five simple machine are the wheel and axle, pulley, inclined plane, wedge, and screw. Simple machines are combined to form complex machines. For example, if you attach a lever to a wheel and axle, then put a bin on top, you've built a wheelbarrow. A lever consists of four parts: the load, the fulcrum, the effort and the lever itself. The load is the point that exerts force on the object being manipulated by the lever, such as the bin of a wheelbarrow. The fulcrum is the point at which the lever pivots, such as the center of a see-saw. The effort is the point at which a person or machine exerts force on the lever, such as the handle of a crowbar. The lever is the structure that connects the other three parts. There are three different classes of lever. A first-class lever has the fulcrum between the load and the effort. A second-class lever has the load between the effort and the fulcrum. A third-class lever has the effort between the load and the fulcrum. A see-saw is an example of a first-class lever. A wheelbarrow is an example of a second-class lever. A fishing rod is an example of a third-class lever. A pair of pliers consists of two levers working in opposite directions. The load of these levers is the point where the pliers grip. The effort is at the handles, the point where the user grips the pliers. The fulcrum is at the nut where the pliers rotate. Because the fulcrum is between the load and the effort, both levers are first-class levers. When you exert force on the effort of one of the levers in a pair of pliers, that force is multiplied several times before it is exerted on the load. The fulcrum changes the direction of the force as it pivots. When you squeeze the pliers, both levers exert force at once, in opposite directions and towards each other. Anything in between the load points on those levers will be squeezed with several times the pressure you apply to the handles of the pliers.